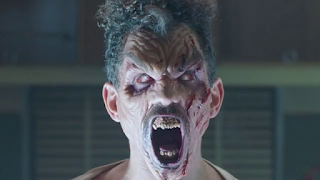 Pablo Simon Bolivar (Ray Santiago), loyal sidekick to Evil Dead franchise hero Ash Williams (Bruce Campbell), has been possessed by the forces of evil for too long. Sure, he only just got turned into a Deadite near the end of the episode 'Apparently Dead', the third episode of the third season of the Starz television series Ash vs. Evil Dead, so he hasn't even been possessed for an episode and a half by the time the fifth episode, 'Baby Proof', begins... but that's still too long to have Pablo out of the good guy game. Thankfully, the evil leaves Pablo's body early on in 'Baby Proof'. Problem is, this happens when Ash's newly discovered teenage daughter Brandy Barr (Arielle Carver-O'Neill) plunges the Kandarian dagger - a blade we first saw way back in the first Evil Dead movie - into his chest. This allows Pablo's spirit to meet with his late brujo/witch doctor uncle (Hemky Madera) in a void in the afterlife that's hidden from the evil, where Pablo has to play a guessing game with serious stakes. We're talking Indiana Jones and the Last Crusade sort of guessing game stakes. 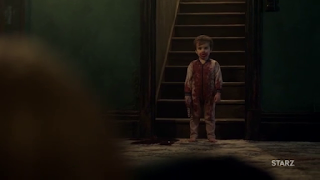 While Pablo is making choices that will decide whether he dies or becomes a powerful brujo himself, Ash is busy stumbling around in the mansion lair of the demonic Ruby (Lucy Lawless) with a young European babysitter he nicknames "Ricola" and "Heidi" (Samantha Young), fighting the toddler the girl was meant to take care of. Yes, Ash's major opponent in battle this episode is a toddler, which isn't an unexpected level of absurdity for this show to go to. Things have gotten a whole lot crazier on Ash vs. 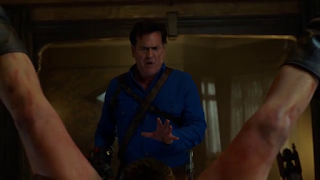 Evil Dead than the sight of Ash being menaced by a small child - although director Daniel Nettheim (who also directed the previous episode, 'Unfinished Business') and writer Luke Kalteux (who wrote the season two finale 'Second Coming') did manage to work some jaw-dropping surprises into their confrontation. The toddler is the child Ruby gave birth to earlier in the season after consuming an image of Ash off a page of the Book of the Dead, the Necronomicon Ex Mortis. Evil magic sure gets weird sometimes. This kid is basically a clone of Ash, but since he was created from an image of Ash in which he had on his chainsaw prosthetic that replaces his lost right hand, the kid was born with an organic chainsaw for a right hand. And this organic chainsaw runs and cuts things up just as well as Ash's regular chainsaw does. If the thought of Ash relentlessly trying to kill a little kid disturbs you, you can set those fears aside. Ash isn't out to kill the giggling little creep. In an effort to prove to Brandy that he's not a chainsaw or trigger happy lunatic, Ash sets out to capture the evil tyke alive. A decision Ricola/Heidi (apparently the character's name is actually Natalie) does not agree with. When you see what the kid is capable off, her determination to kill him is understandable. When 'Baby Proof' reaches its end, this season of Ash vs. Evil Dead has reached the halfway point. You can sort of feel that fact while watching the episode, because it feels like a stepping stone that shakes up the characters so things will be different in the second half of the season. Brandy finally accepts Ash as her father. The evil is expelled from Pablo and he realizes what his place is within all this monster fighting business. There's an important moment between Pablo and Ash's other sidekick Kelly Maxwell (Dana DeLorenzo) - who, for a time, had an evil version of Pablo's mouth growing on her leg. She figured out how to handle that situation better than most people would have... certainly better than Ash probably would have. It's a stepping stone, but it's a step that's fun to take because it delivers some nice character developments and a fun monster fight.